You will find info about the book, author, an excerpt and my 5 star review in this post. 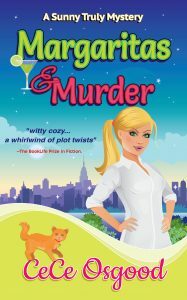 Stephanie Plum meets Bridget Jones in this hilarious yet suspenseful cozy mystery featuring Sunny Truly, a brand-new apprentice private investigator in Austin, Texas. When a long ago childhood friend is found dangling in a tree—with a dead man in her apartment—Sunny is hired to prove the friend innocent of murder. Frumpy, earnest and stubborn, Sunny goes undercover as a glam-girl to ferret out suspects at the club where her friend worked. With the aid of her wise-cracking boss, Cleve Haylock, and swoon-worthy police detective John Rock, Sunny uncovers an ugly secret with deadly consequences. Will Sunny be the next victim? CeCe Osgood lives in Texas after many years in LA working in the film industry. Her writing career includes magazine articles and screenplays as well as being a freelance story analyst (main client HBO). She also has had two screenplays optioned. Being a novelist has been her lifelong dream, and now it’s becoming her reality. She loves red wine and hates pretzels. CeCe’s first novel, THE DIVORCED NOT DEAD WORKSHOP, a chick-lit romantic comedy was awarded a Crowned Heart by InD’tale magazine. Earlier in the day, she’d heard the host of her favorite local radio show raving about a coconut cake with a special citrus glaze, which just so happened to be the signature dish of Gaia Athena, the Greek café down the block from her condo. Never having been a dessert adventurer before, Heddy had debated with herself for hours … until the urge for an exotic treat overwhelmed her traditionalist taste buds. Decision made, she laced up her size five orthopedic sneakers and ambled down the block. “Goodness,” she said to the cake as she took it out of the box and placed it on a marble cutting board. “You smell divine.” Using a super sharp ceramic knife, she cut off a wedge and placed it on the Marie Antoinette dessert plate she’d brought back from Paris a decade ago. “Forgive the cliché, but let me eat cake,” she chirped, relishing her twist on the French queen’s notorious remark even though she knew most historians considered it pure poppycock. Balancing the plate on top of a snifter of brandy, she padded across the worn Berber carpet and opened the sliding glass door leading out to her small balcony. Easing her tiny tush into a white wicker rocker, Heddy set the plate on the table next to her and sipped the brandy as she gazed out at the street. At least the building owners had kept their word about not uprooting the live oak trees. Without those beauties lining the streets, this neighborhood would be intolerable, especially during the traffic heavy daylight hours. A sleep disorder had forced Heddy to adjust her daily routine. Now her mornings started around one p.m. and she’d have lunch at six or seven in the evening, with dinner time close to midnight. She took another sip, grateful that the night was so quiet and soothing. Moments later, as she was returning the binos to her pocket, an eerie sound startled her. With her brows knitting together like a hooked rug, she peered up and down the tree-lined street. The sound, fainter this time, floated in the air again. Was it a whimper? A cry? A howl? Goose bumps welted up on her arms. She’d heard about a mountain lion sighting in the hill country west of Austin. But here in the city? “Oh, my God,” Heddy gasped. A woman’s foot … in a shiny red shoe. The early morning sun blazed like a wildfire on my bedroom walls. It was the thing I hated most about this apartment. I could live with the crappy neighbor downstairs, the dicey air conditioning, and the lousy garbage pick-up, but the eastern sun blasting me out of bed in the morning drove me craaazy. Darn things had cost me a bundle, so you’d think I’d remember to close them and not have to wake up to this blinding light on a sleep-in Sunday. I sat up and plucked my glasses off the nightstand, hooking the dangling right arm around my ear. I’d sat on them yesterday and the glue I’d used wasn’t holding well. Once again, I’d fallen for the advertising BS. Stick It Right – It Never Fails. Yeah, right. A disdainful amber eye slit open, then shut again. I snorted a laugh. That snarky look of hers always got to me. “I should rename you Judge Loki and get you a TV show,” I said nudging her with my toe again. She ignored me again. Not ready to wake up just yet. I wasn’t either, but my rumbling stomach had other ideas. Ideas that included jumping out of bed, exchanging my Shrek pajamas for jeans and a tee shirt, and driving to Juan In A Million, a to-die-for breakfast joint famous for its Don Juan tacos—a secret combo of spices, potato, egg, bacon and cheese in a piping hot tortilla. “After last night, I deserve a yummy breakfast,” I muttered aloud. Last night I’d had been forced to eat baked chicken, barely seasoned, with steamed cabbage and green beans. No potato, no rice, no carbs. All due to my sister’s new diet. I glanced at the clock on my wall. Hmm. Maybe I could sneak out, eat a couple—or three—Don Juans and be back before Lila woke up. She’d spent the night on my couch. I yawned, stretched and was giving myself a pep talk about getting in a few pushups when my cell phone rang. Uptown Funk. The ringtone for Tiffany, my longtime best friend, who’d recently been hired by a wealthy art dealer to check out new emerging artists. We disconnected and I rolled out of bed. I was on my way to the bathroom when a sudden pounding on my front door scared the bejeezus out of me. Margaritas & Murder is as charming and playful as a field of pink bluebonnet flowers. Get ready to lasso a good read! Meet Sunny Truly, an eager apprentice Private Investigator, who uses her Texas sass to solve mysteries. Margaritas & Mysteries is the first book in the series, so we are introduced to the main cast of colorful characters. The head of the P.I. firm is Sam, who acts like a “laid back good ole from Texas, but in truth he was a keen observer of people and attuned to the contradictions of human nature.” The office manager is Delia, “as moody as a hormonal teen, even though she was middle-aged.” As the story progresses, we meet Sam’s adult son, Cleve, who takes over when Sam is hospitalized. Outside of work, Sunny has friends and family. Her sister is Lila. As Sunny explains, “I am the sensible, level-headed one, the practical one. Lila is my party girl sister who knew how to step over the line, jump the line, kick the line in its rump, and pretty much get away with whatever she was up to.” But the one trait that both sisters shared was “pigheadedness.” We also meet her best friend Tiff, and her parents. There are many other characters who are involved in the mystery. The book starts off with a bang, when a little old lady who is drinking brandy on her balcony, notices a startling sight involving a red shoe. Sunny faces her first mystery as a rookie P.I. when Lila’s friend Joyce sustains serious injuries and then is accused of murder. Sunny careens into high society, a trendy private club, and a mud pit with a snake as she tries to help. Sunny is a fixer and tries her best. She also has the help of a handsome detective. Hello Jena C. Henry. 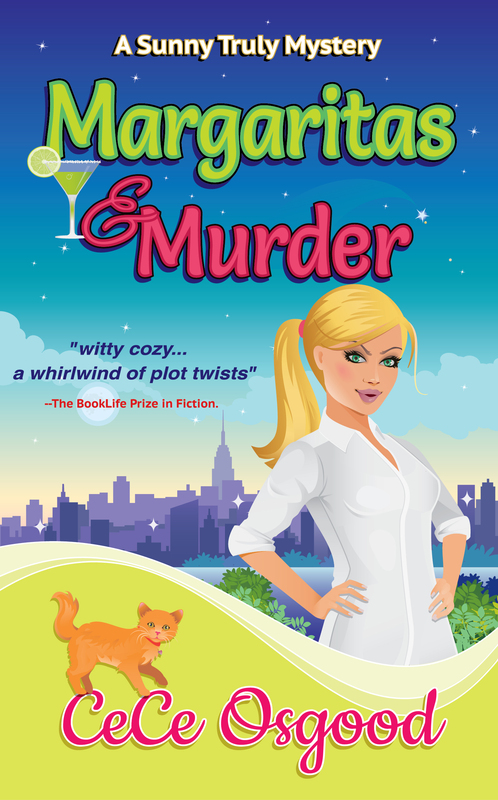 Thank you for the delightful review of Margaritas & Murder! Is it possible for you to post it on Amazon? The book is only available there as I’m in the KDP Select program. I’m thrilled you enjoyed it. Thank you again. Thanks CeCe- my pleasure! I had a blast reading your fun book. I did post a review on Amazon- I am Happy Reader (so you wouldn’t have known.) 5 stars- posted on September 11. Good luck and I will keep in touch.